These photos show how time has changed a bend of Fairmont Boulevard in central Yorba Linda. From top to bottom, these photos were taken on: Feb. 11, 2014; Feb. 22, 2014; and Aug. 8, 2014. Click for full-size image. Take a look at the photo collage to the left. As this picture shows, time can transform a person or a place beyond any of our pre-held comprehensions, for good or, unfortunately, for bad. Fortunately, though, we, having hope and faith, are able to overcome pain or death. But hold that thought for a second. First, I want to announce that this blog is celebrating its fourth anniversary. It lived its first three years as timothyworden.wordpress.com before becoming timothyworden.com last August. In the past month I have transferred my domain to the less wordy tworden.com. In this blog’s four years, I have had more than 17,000 page views. 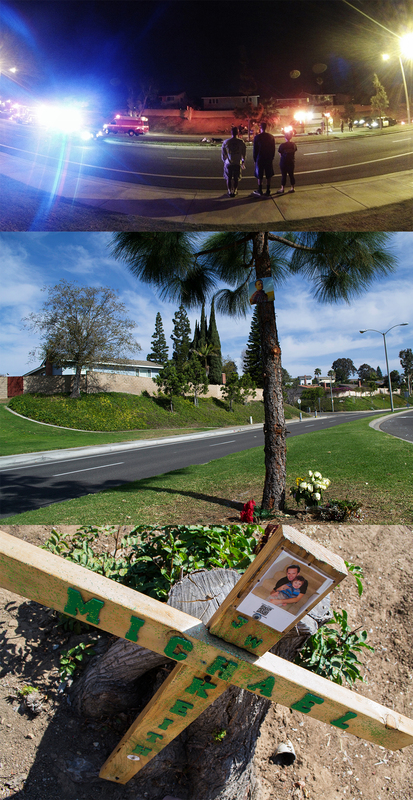 The most page views I have had in a single day is 290, which came in February 2014 when I blogged about a memorial that had been set up in Yorba Linda in honor of a 22-year-old man who died in a motorcycle crash. Recently, that man’s friends and family set up a roadside cross memorial at the spot of the crash. A visual journey of what that scene has looked like in the past six months is presented in the photo to the right. I pray that his friends and family, including his son, will find comfort in what has happened. We can become overcome by our circumstances, or we can take this event and grow from it, attempting to make the world a better place for the rest of us who are living. Remarkably, it is often those who are closest to the victim who understand this, I have found. Just this week, a man was killed and two women were injured when an assailant walked up to their parked car and shot them 7-10 times in Santa Ana, police said. About 20 hours after that shooting, on Wednesday, Aug. 13, I happened to pass the scene on my way home from work in Santa Ana. I had my camera and reporter’s notebook with me, as I always do, so I decided to check out the spot to see if there was a vigil going on. Inching down the residential street a block off the busy Main Street downtown area, I saw a few people gathered. I saw them give hugs to each other. They were holding flowers. A woman, who looked to be no older than 21 or 22, was fighting back tears. 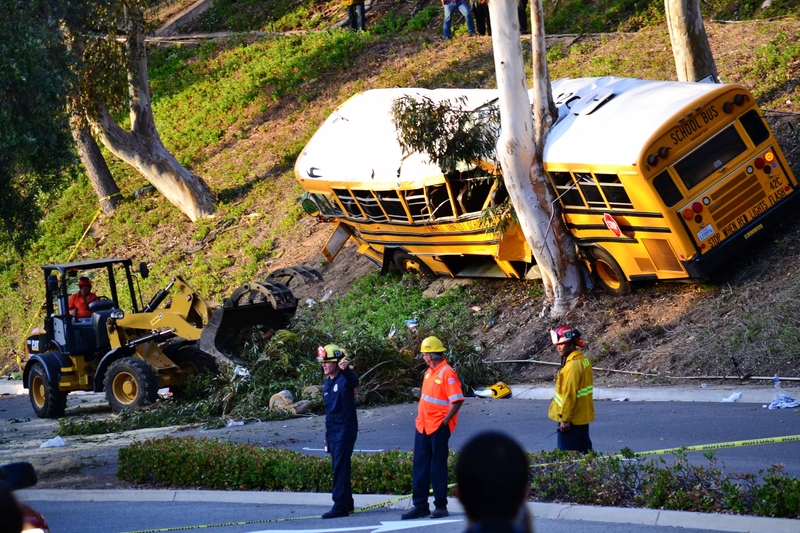 Workers break up a tree that fell as the result of a school bus crashing into a tree in Anaheim Hills in April 2014, resulting in about a dozen injuries. But this gathering of friends consoling each other really brought it home. I shelved any notions of reaching for my camera, and instead drove off. The whole encounter must have lasted 15 seconds. I say this to draw attention to the fact that life is frail. Our friends, or we ourselves, can be taken at any moment. As I go forward in this blog, I am determined to, in the event of covering a death or traumatic experience, honor the life not only of a victim, but of his or her friends and family who are left to cope with a difficult situation as well. It is my wish to leave a positive contribution to the world, and, however small it may be, I intend to use this blog for that purpose. I can’t do that on my own, however. Jesus, who is God, gives us hope and strength. No matter how it looks to us today or tomorrow, Jesus, who has resurrected and conquered death, has a plan to work everything out for good. “The Lord is my rock and my fortress and my deliverer,” he said in Psalm 18. I am finishing up a feature report on the recent murder trial of the beating death of a 23-year-old Orange County woman. This report will examine the media implications that trial has had, reflecting on how technology has impacted not only our daily lives, but that of the police and legal system. It will be published in three parts beginning with an expected date of Monday, Aug. 25, 2014. Text and photos by Tim Worden. Congratulations on the anniversary, Tim! Thanks for sharing your skills with the world.